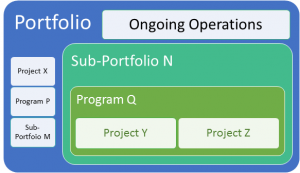 Do you understand the difference between Project, Program and Portfolio Management? Generally all of us use Project, Program and Portfolio in day to day language without really giving a thought about the underlying meaning of these terms. But, most of the project managers find it difficult to distinguish between these terms. 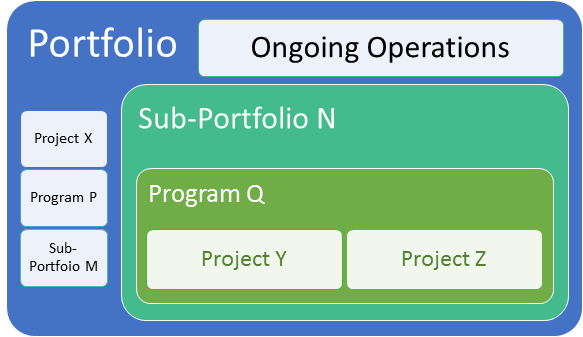 I have written this post to define and differentiate between Project, Program and Portfolio. I have explained the importance of these terms in Organizational Management and what is the role of Project, Program and Portfolio Mangers. I have provided some industry examples to distinguish between the said terms. Let’s look at the following statements. These statements might resonate with you – you would have either made them yourself or heard them from someone close to you. My New Year resolution for this year is to complete the PMP certification. This is my personal project. I will pass the exam in next two months. Our company has initiated a social fund raising program. I am lead member of the team. We have taken a multi-pronged approach to raise the funds. I have an investment portfolio of five stocks, three mutual funds, and a few debt instruments. I should be able to meet my life objectives through these investments. Project, Program and Portfolio are common day to day English words with simple meanings. We use these words regularly without even realizing that we are using them. But when it comes to Organizational Management, most people are not sure how to use these terms. Different companies use them differently. Different stakeholders within a company use them differently. Usually, there is confusion around the meaning of these term. Let me allay this confusion. Project Management includes, among many other things, balancing the project constraints. These constraints include, but are not limited to, Scope, Time, Cost, Quality, Risk, and Resources. You can also refer to Max Wideman Glossary to read some other standard definitions of Project. Related projects, subsidiary programs, and program activities that are managed in a coordinated manner to obtain benefits not available from managing them individually. The projects within a program share a goal. They are related to each other because of the shared program goal. If all the projects within the program are not successful, the final goal of a program is either not met or partially met. Each project in a program creates a unique product, service or a result. Outcome (product, service or result) of one project may be used by the other projects within the same program. These outcomes collectively contribute towards the shared program goal. Program Management involves coordination among the constituent projects so as to obtain the benefits that might not be obtained if they are managed individually. Program Management may also involve completing some work that is outside the scope of individual projects. You can also refer to Max Wideman Glossary to read some other standard definitions of Program. Note: Related projects may or may not be similar. Similarity may come from deploying same/similar technology, using shared resources, working for the same client etc. If the projects are similar but not related, then they should be managed as part of a Portfolio. Projects, programs, subsidiary portfolios, and operations managed as a group to achieve strategic objectives. Portfolio is a collection of projects programs and operational work. The projects and programs within a portfolio are not related to each other. The constituents of a portfolio are used to fulfill strategic business objectives of an organization. Strategic business objectives could include maximization of profits, building brand & reputation, reducing overall costs, and optimization of resource usage. Portfolios are aligned to the business and industrial domain of an organization. You can also refer to Max Wideman Glossary to read some other standard definitions of Portfolio. A consumer durable company is in the business of design, development, marketing, and servicing consumer products like refrigerators, washing machines, air-conditioners (AC) etc. Portfolio Management – The Company, itself, is the largest portfolio. Different divisions like Refrigerator Division, Washing Machine Division and AC Division would be sub-portfolios. Each sub-portfolio would be headed by a Division Head like a Vice President. The portfolio and sub-portfolios will have running programs, projects and operations. Program Management – Each division within the company would have several running programs e.g. Launch a new line of refrigerators. This program could involve several projects e.g. a design project (refrigerator design), a manufacturing project (setting up refrigerator manufacturing), a marketing project, a servicing project (training post-sales servicing personnel) etc. The projects within the program might be executed at different times by a different set of people but they will be governed by the larger shared goal of “making the new line of refrigerators successful”. Project Management – The Company would have several running projects at any given point in time. These project may or may not be part of a program e.g an IT project to implement a Customer Relationship Management (CRM) software may not be part of any program. A real estate company is in the business of constructing buildings and performing related work to fulfill the unmet public demand. Portfolio Management – The Company, itself, is the largest portfolio. Different divisions like Commercial Division and Residential Division would be sub-portfolios. Commercial Portfolio could include construction of malls, shopping complexes, and office buildings while Residential Portfolio could include construction of residential buildings, and row houses. Each sub-portfolio would be headed by a Division Head like a Vice President. The portfolio and sub-portfolios will have running programs, projects and operations. Program Management – Each division within the company would have several running programs e.g. a Residential Township at location X. This program could involve several projects e.g. construction of row houses, construction of a multi-storied residential building, construction of a club house, landscaping project, marketing project etc. The projects within the program might be executed at different times by a different set of people but they will be governed by the larger shared goal of “making the township successful & livable”. Project Management – The Company would have several running projects at any given point in time. These project may or may not be part of a program e.g a procurement optimization project to reduce material procurement costs may not be part of any program. Optimization of organizational cost, resources etc. What is The Role Of Project, Program And Portfolio Manager? By now you would have understood the meaning and finer differences between the main terms. The role of a manager is related to the tasks expected from her/him. Just notice the major tasks written in the table above. The role of respective managers is to complete these tasks. What is your take on these terms? How do you use them in your organization? Do you use them differently? The provided information helped me a lot to clear my concepts on the mentioned terms. Program means group of related projects as mentioned in PMBOK 6. However, in the flowchart in the same chapter , it is shown that operations also part of program. 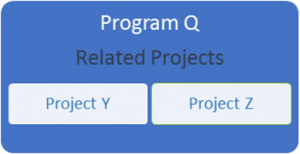 Can we conclude that program means group of related projects & operations ? Programs may include some operational work to support the projects under the program. But, these (program) operations are not managed by program team. Thanks for your inputs.1 example I think of is logistics or order fulfillment team who delivers the material or products at the project site for installation & commissioning work. However,this may be applicable to standalone project also where similar operational work is needed. Yes. Projects are often supported by operational teams. Thanks for the explanation! It took me a while to get here but I am glad I found your site.